What makes the Cuyabeno, the most beautiful place in Ecuador so different from most other parks? Is it its seize of 600,000+ ha; Is it for being the most biodiverse jungle in the world? Is it because it is co-managed by the Cofan Indian Nation? 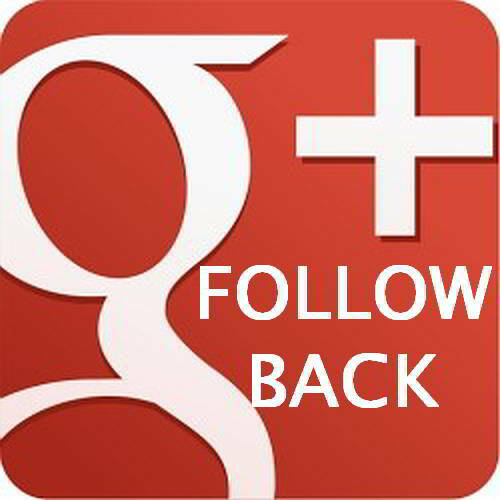 In fact it is for all of the abover. 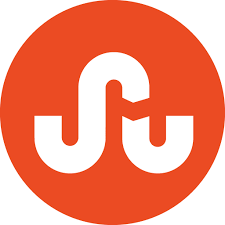 Read its fascinating history! 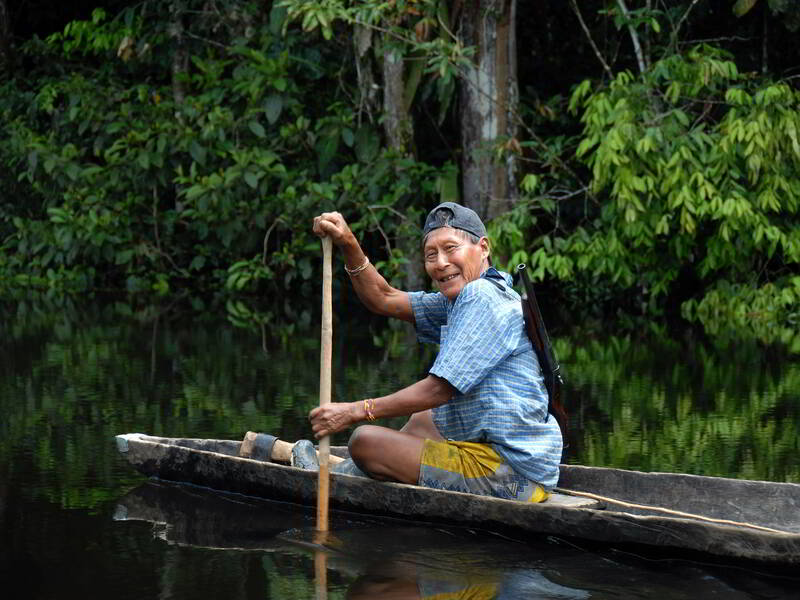 The Cofan people have occupied the watersheds of the upper San Miguel and Aguarico rivers for uncounted generations. Spanish explorers tell of encounters with the Cofans in these regions as early as 1536, and early missionaries established missions in the area in the early 1600�s. At the time, the Cofan people were both numerous and politically organized, with well-established towns and a loose city-state system that allowed considerable autonomy among the towns while ensuring a fast and potent response to any outside threats. Trade routes extended in all directions, with Cofan traders climbing into the Andes, and exploring as far as the mouth of the Amazon. In the late 16th century, Cofan political hegemony extended as far north as the Sibundoy valley, and at least as far south as the Coca River valley. Today, the Cofan represent the last remnants of one of the most exciting, vital, knowledgeable and rich cultures that ever emerged from the Amazon basin. This culture, with centuries of slowly developed wisdom, holds the keys to an incredible body of information concerning the region. The secrets of over 200 medicinal plants, oral histories of natural events which have devastated the region in the past and need to be considered for the future, an incalculable knowledge of the birds and mammals in the area, and a deep love and understanding of the every day rhythms of the Amazonian rain forest, are just a few of the important contributions these seemingly insignificant communities make to the province, the country, and the world. While no longer warriors, the Cofan still like hunting, albeit, nowadays in a sustainable way. Particularly the raising of chickens to provide protein has reduced the need for hunting. 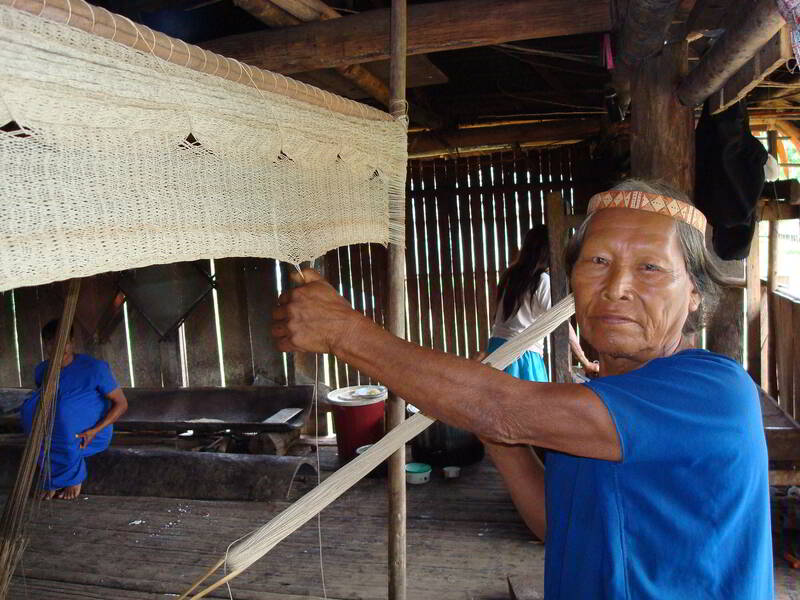 Among many of the Cofan traditions is the weaving of the original Amazon hammock. The name of the Ecuadorian province Sucumbios is derived from the Cofan name for the San Miguel River, that forms the North-eastern border between Colombia and Ecuador. The Cofan name "Tsacumbio Na�e" means �the River of Much Water�. Hence the people of the Tsacumbio Na�e were known locally as the �Tsacumbionae�su A�i�, subsequently corrupted by the Spanish to Sucumbios. 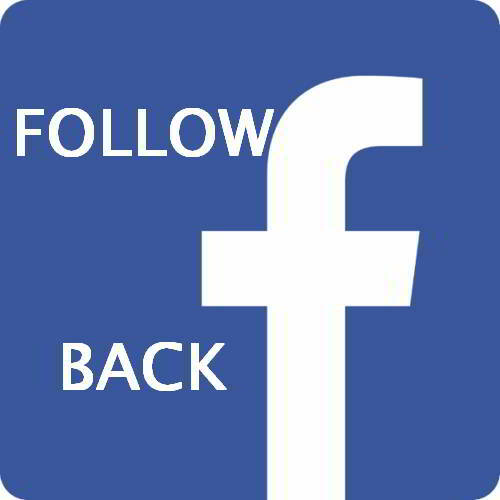 The name �Cofan� derives from Cofa Na�e, meaning �Important River� the Cofan name for the Aguarico River. Drawing heavily on the early Jesuit and Franciscan stories, it would appear that there were approximately 20,000 Cofan language speakers in the early 1600�s. These, in turn, were part of a since-lost linguistic and cultural stock that included the Quijos and perhaps the little known Yumbos to the south, and other social groups to the north. Individual villages were as large as 3,000 people. The main centers of Cofan activity were on the Guamues, San Miguel, Aguarico, and Coca rivers, but incursions with occasional colonization occurred both to the north and south of these river systems. While we have little data concerning the foothill areas in what is now Colombia, we know that Cofan villages were found as far west as the present sites of La Bonita (on the Aguarico) and Oyacachi (Cayambe); and even today, Cofan presence on the Putumayo (El Hacha, Tablero, and Remanso) and on the lower Aguarico (Zabalo) indicate how far east this tribe extended. Cofan national borders probably encompassed over 6,000,000 hectares in 1550. The Cofans of this time were considered fearsome warriors, wielding slings, bows and arrows, spears, and hard wood swords, in pitched battles with neighboring tribes and invaders. Early Spanish accounts speak of the fear in which the Cofans were held by the Yumbos, Quijos, and other nearby tribes. 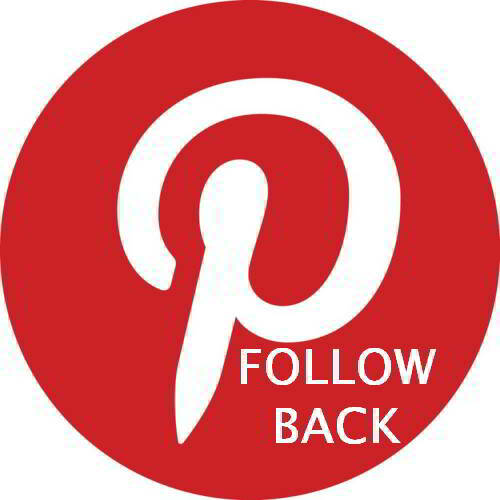 They roundly defeated three separate Spanish armies sent out to �punish� them during the middle to late 1500�s. Then, taking the offensive, they burned the colonial town of Mocoa to the ground, and chased the Spanish into the mountains, eventually laying siege to Pasto. Only the arrival of an army from Bogot� saved the city. The Cof�n were heavily reliant on rivers for trading and for food. 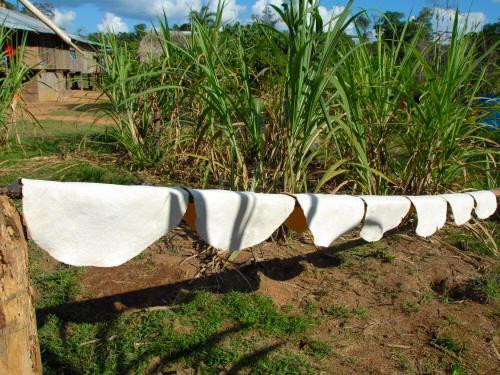 Shifting cultivation was the primary source of their staple food, consisting of corn, plantains, manioc, and bananas. Fishing and hunting provided their protein. They traded weapons, necklaces, hammocks, and feathered crowns for cloth, salt, and other supplies. While no longer warriors, the Cofan still sell blow guns, but now to their visitors, while teaching how to use them. They were among the many foothill peoples who wore cotton or bark cloth clothing, although there is no archaeological or cultural indications that the Cofans ever developed their own weaving industry. Likewise, ceramic remains in old Cofan village sites are very utilitarian, with the occasional startlingly developed pieces probably deriving from trade. Trade for both their cloth and their finer ceramic wares was based on a variety of sophisticated products, ranging from superior blow gun poisons (over 15 ingredients were used) to highly sophisticated andesite and basalt stone axes. Trade routes were extensive. 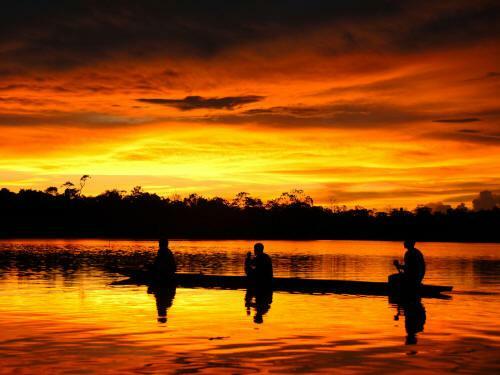 Cofan traders regularly visited Iquitos and Manaus as late as the early 20th century, and descriptions of the mouth of the Amazon and the upper reaches of the Ucayali both figure in oral histories. 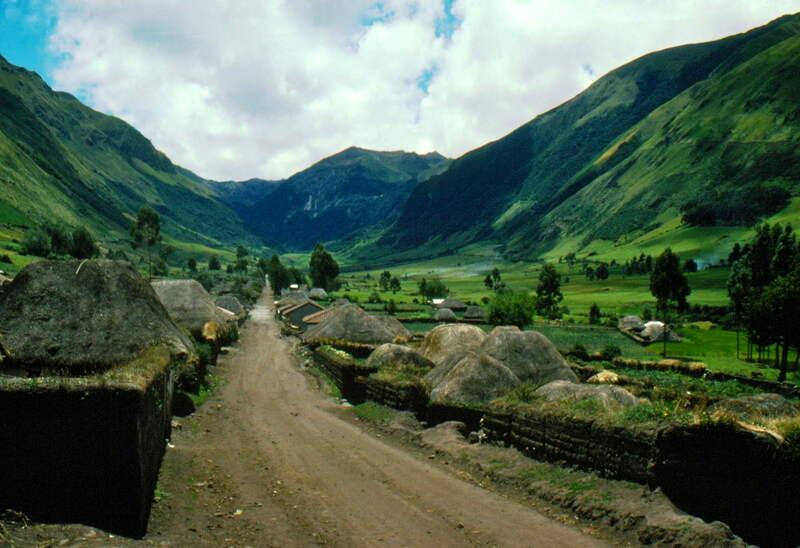 Foot trails ran up through the mountains, and visits to Quito and Bogot� were frequent into the 1930�s. 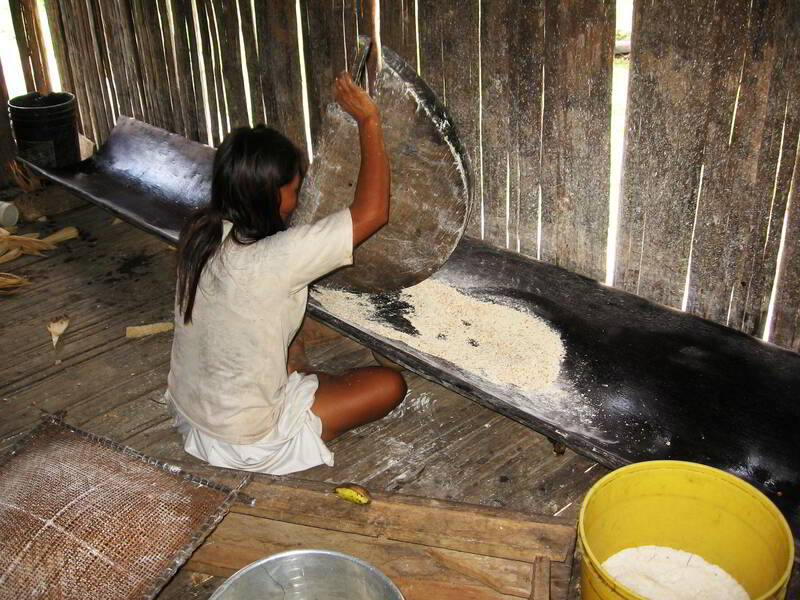 Cofan folklore mentions the importance of salt, cloth, and beads as desirable commodities. Along with most of the other more developed cultures and language groups of the Andean foothills, the Cofan people�s multiple contacts via trade and war were to prove their undoing in the years following the Spanish arrival. Diseases, unchecked by either genetic resistance or by an understanding of how to treat them, wiped out whole towns and villages. A trader, fleeing an epidemic in a host village, unwittingly would transport the sickness to his own village. One after another, the more �civilized� riverine groups of the upper Amazon were decimated by a lethal cocktail of measles, polio, malaria, yellow fever, smallpox, cholera, and other diseases brought over by the Europeans. 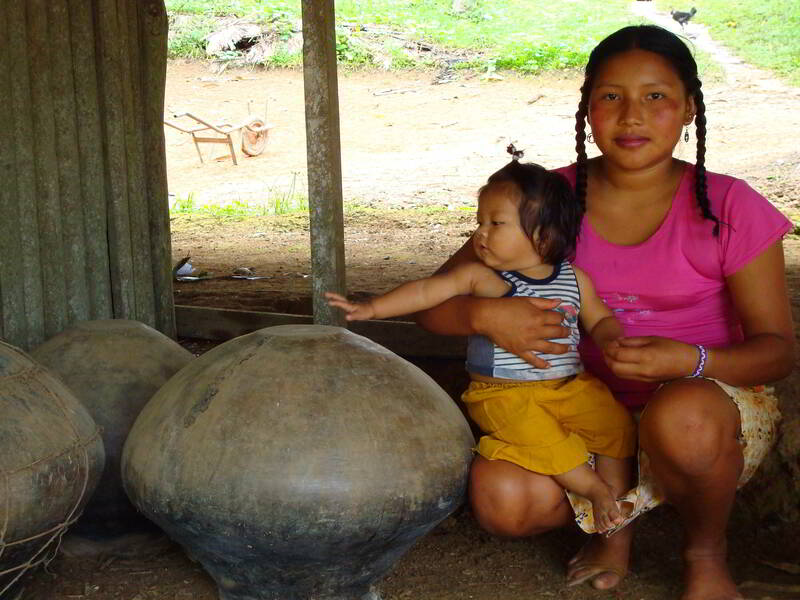 The Cofan population crashed during the 17th century, never to recover to its pre-Columbian numbers. 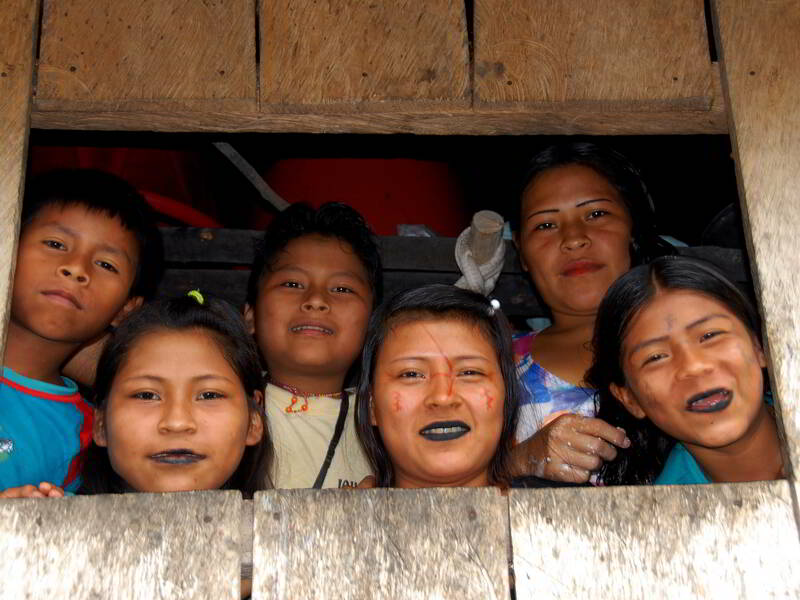 Only about two thousand Cof�n are currently living, most of them being multiethnic. 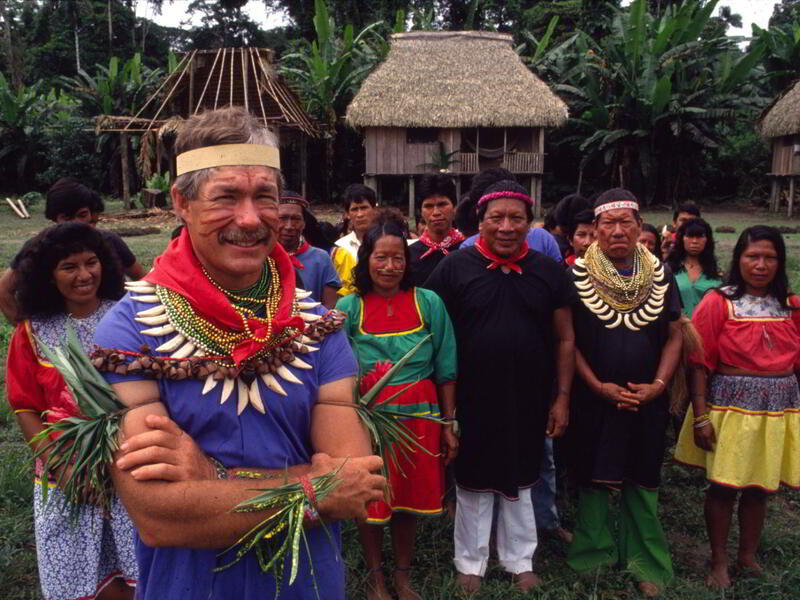 Despite their mixed ethnicity, the Cof�n still identify themselves as as a�i (which can mean �human�, �Cof�n�, or �indigenous person�), and individuals who are able to speak A�ingae (the Cof�n language) and participate socially can be considered a�i, even if they are not entirely ethnically Cof�n. The all-time low probably came in the wake of a disastrous measles epidemic during the early 1920�s that left the upper Napo and Putumayo watersheds almost empty. An estimate in 1945 suggested a total of 430 Cofans surviving, and this is almost certainly up from middle 1920�s population. 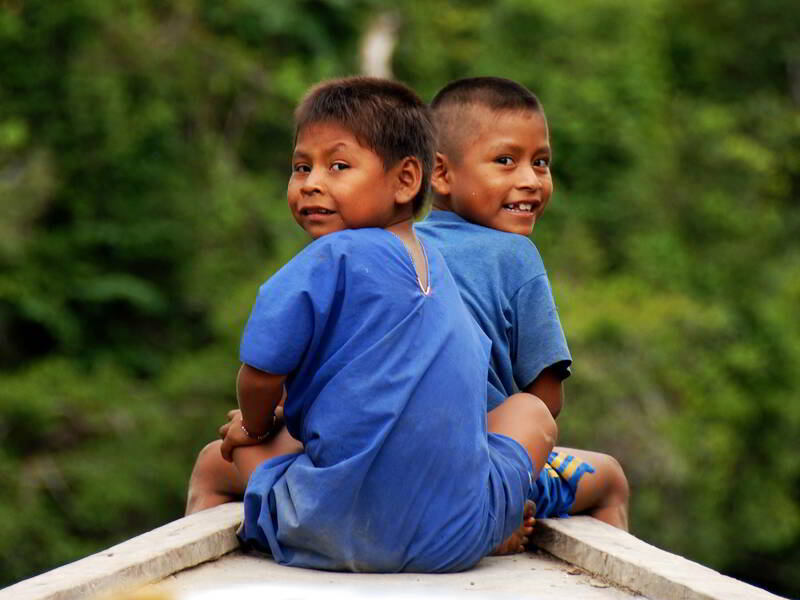 Cofan and Secoya Indians as they now both live in the same region along the Aguarico River. 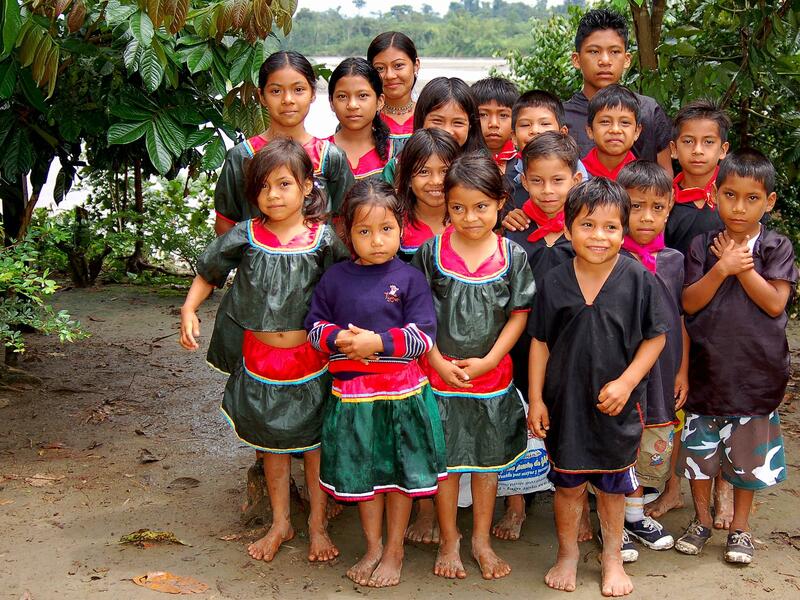 Multietnicity is common among the Cofan and other Amazon tribes. However, in spite of the tremendous loss in numbers, the Cofans still enjoyed the wide-open expanses of their traditional territories. They continued to actively utilize the four major river valleys they had traditionally occupied, while overlapping with the neighboring Siona-Secoyas. 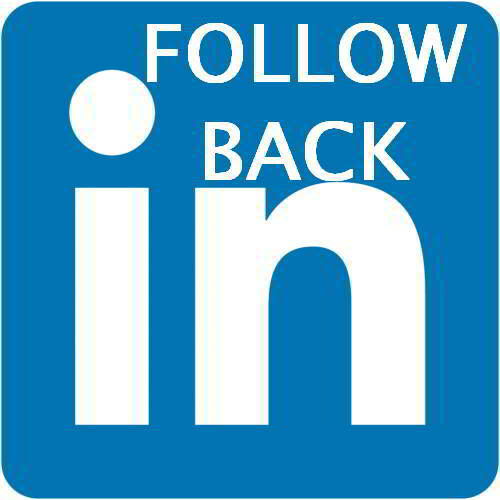 The arrival of Shell Oil Company in the late 1940�s heralded a major change in this scenario. Although Shell pulled back after a brief exploration, the word was out that oil, the life blood of the Western world, existed under the Cofan territories. Getting it out was only a matter of time. If Shell had pushed through with their development, there is no telling what would have become of the few remaining Cofans. At the time, neither the Ecuadorian nor the Colombian governments had clearly defined policies regarding the ancestral rights of their indigenous groups. The Cofans had no knowledge of the outside world, other than that gleaned on trading trips, and no concept of ownership of land. More importantly, they had no idea of how to deal with the Western world. Most spoke no Spanish, and only one or two Colombian Cofans had any idea what writing was all about. There were no provisions at the time for vaccination programs, nor was the Cofan knowledge of health care sufficient to have coped with an influx from the outside. It was providence that Shell backed out, leaving the Cofans in peace for a few more years. About a decade later, American missionaries of the Summer Linguist Institute arrived on the scene. First contacts were in 1954, and by 1955, Bub and Bobbie Borman, a young husband and wife team of missionaries had taken up residence in Doreno, a village on the central Aguarico. With them, they brought Western medicine and vaccines, just in time to prevent the total extinction of the population. 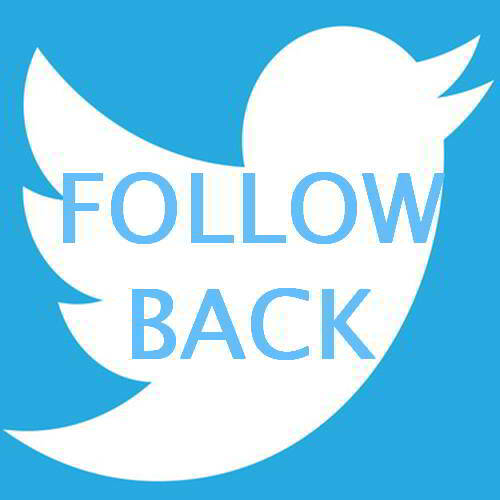 They also began to teach the rudiments of how to read and write, handle money (long a source of puzzlement and frustration for the Cofans), and how to understand some, at least, of what the Western world was all about. 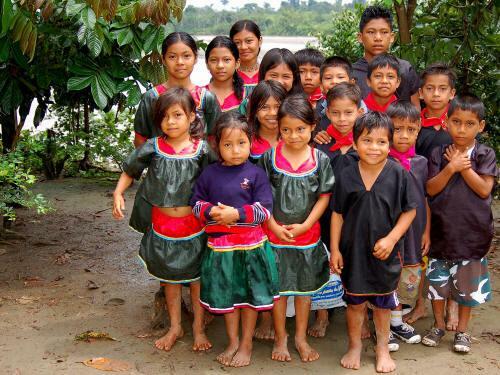 Children showing off their traditional clothes. Men enjoying a traditional meal. Their intervention was just in time, because only ten years later the oil companies came back to stay. Texaco-Gulf invaded the area with the precision of a conquering army, establishing depots, building heliports and airstrips, and soon, drilling exploratory wells. The wells confirmed the riches beneath the Cofan territory. 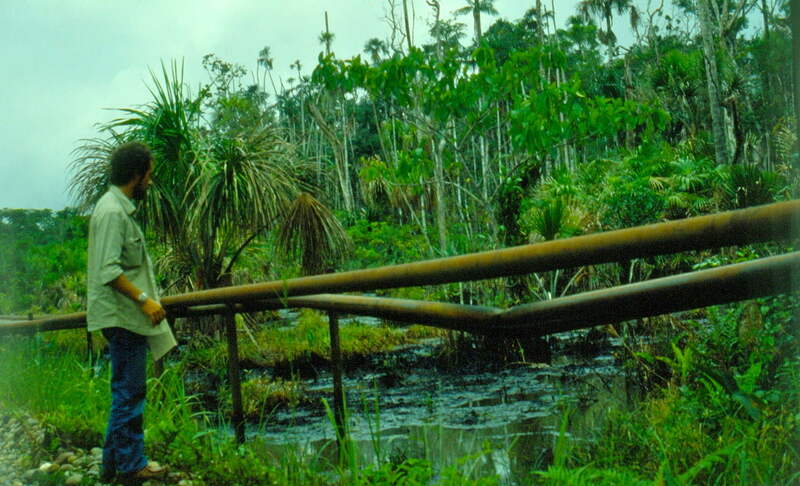 During 1970-72, an oil pipeline was built across the Andes mountains to connect the new wells to the Pacific Ocean. To service it, a new road was created, linking the rest of Ecuador with the Cofan territory. And in its wake, came thousands landless farmers from the mountains, referred to as colonists. Within four years, the Ecuadorian Cofans lost almost all of their territory. 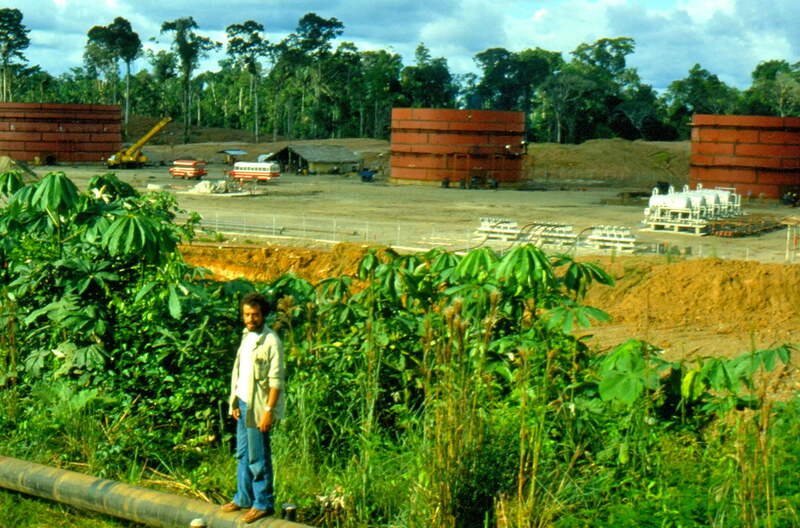 By 1978, the remaining Cofan communities were beginning to recover from the initial impact. Doreno received title to approximately 9,500 hectares, and Dovuno to 4,000. The other communities moved back farther and farther from the colonist in-roads. Tortillas or pancakes made from cassave drying in the sun. Traditional pottery is very utilitarian. The Cofans on the upper Aguarico abandoned their homes on the north side of the river and moved to Sinangoe to establish their village. The Cofans along the San Miguel either moved to the Colombian side of the river - where the political situation was a little bit better in regard to indigenous land rights - or back into the forest. The village located at the mouth of the Bermejo River fled as Quichua and Spanish-speaking "colonists" pushed in, and established a small settlement at the mouth of the Chandia Nae. 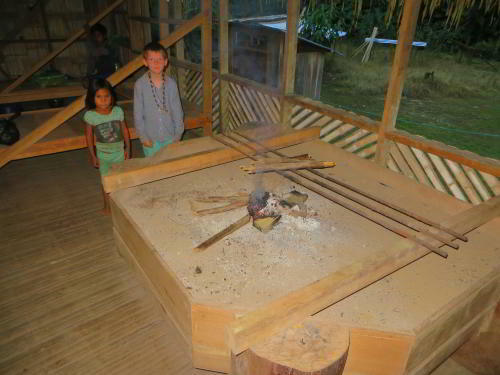 To this site came Shuar colonists from lands South of the Pastaza River. 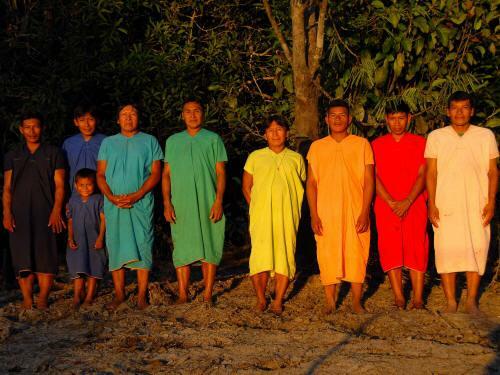 These people, with better education and more political savvy, pushed the Cofan community out of its lands and deeper into the forest. By 1990, the Bermejo Cofans had divided into three separate extended family settlements, one on the upper Bermejo, one on the middle Chandia Nae, and one on the Avie (Bocachico). Cofan political organization in Ecuador began with the slow process of legalization of lands and communities during the late 70�s. By the early �80s, a proto-organization was being formed to incorporate the various Cofan communities into a single political federation. 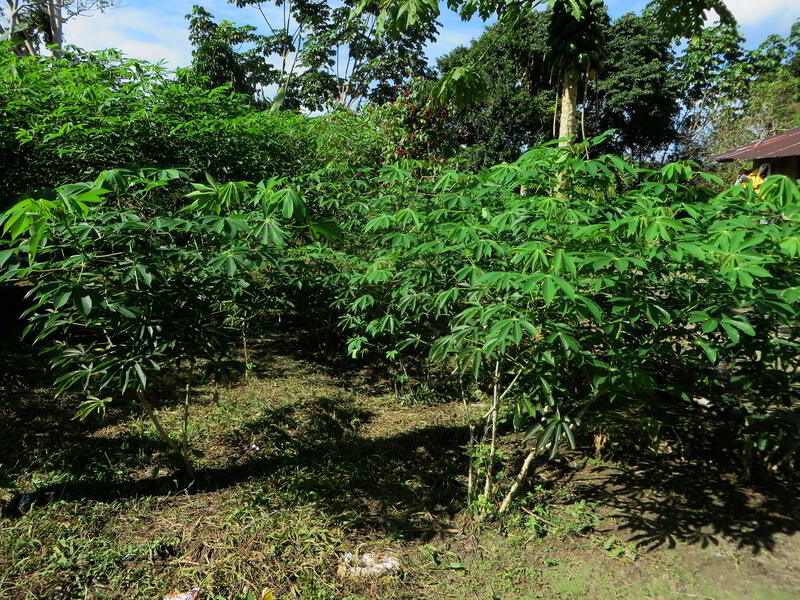 This organization had as one of its highest priorities the consolidation and legalization of the various Cofan communities in Ecuador. Subsequent work resulted in the division of Cofan settlement locations into five communities. These included �Centro Cofan Chandia Nae�, now the official name for the family groups that lived along the Bermejo River and Ecuadorian side of the upper San Miguel River, �Comuna Cofan Doreno�, the principal and most populous group on the Aguarico, �Comuna Cofan Dovuno�, above Santa Cecilia on the Aguarico, �Centro Cofan Zabalo�, in the lowlands far to the east, between the Putumayo and Aguarico rivers, and �Centro Cofan Sinangoe�, in the headwaters of the Aguarico. To protect themselves from the continued pressures from Shuar, Quichua, and mestizo colonists, they set as their top priority the obtaining of land titles. Doreno and Dovuno were the first, receiving titles to 9,500 hectares and 4,300 hectares respectively in 1978. The others were far tougher as ancestral claims were not recognized. The Bormans raised their children in the Cof�n culture and their son, Randy Borman, who married a Cofan, Amelia Quenama de Borman, was accepted as a member of the Cofan Nation. With his American University training he could liaison with international traditional rights movements and communicate with government institutions. Vegetable gardens play an important role in the Cofan food supply. Traditional cooking is still practiced among the Cofan. A Cofan Foundation has been formed to help preserve the culture, restore traditional foods in the rivers and to raise money to send children to Quito for education. While the tribe traditionally employs wooden dugout canoes for river travel, they have recently been building large fiberglass canoes for sale as well as their own use, allowing them to preserve the few large trees growing along the rivers. There is no road access to Cofan settlements. Typically a 3.5-hour trip by motorized canoe is required to reach Zabalo from the nearest road. 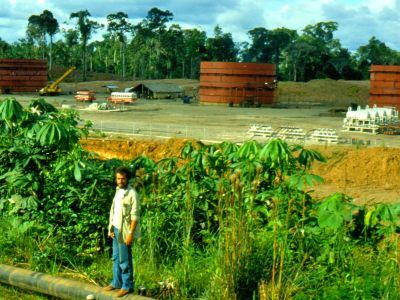 In 1974 a forestry project of the FAO (Food and Agricultural Organization of the United Nations) set off a process that totally changed the conservation history of Ecuador. Until then Galapagos National Park and Cotopaxi National Park were the only protected areas in the country. Much of continental Ecuador was still largely unknown with two third of the country STILL being virgin tropical rainforest: most of the Oriente, as Ecuador calls its Amazon region, half of the outer Andes slopes and most of the Esmeraldas coastal lowlands and mangroves of Ecuador, as well as a good part of the Guayas mangroves. 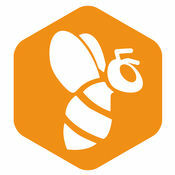 The biologists of the FAO team started exploring the entire country for the best natural areas for their evaluation. The conservation team traveled the four corners of the country, riding four-wheel-drives where we could until they would get stuck in the mud or until going further would be impossible for the presence of cliffs and jungle. They would explore the jungle for weeks on foot, hiring local guides until we would have a feel for the area. For the Ecuadorian Amazon - which was still was covered by 90% with rainforest and incredibly inaccessible, the explorers started combing the region by dug-out canoe as far as they could go into the smallest creeks. What could not be traveled by canoe, was first explored with small airplanes. 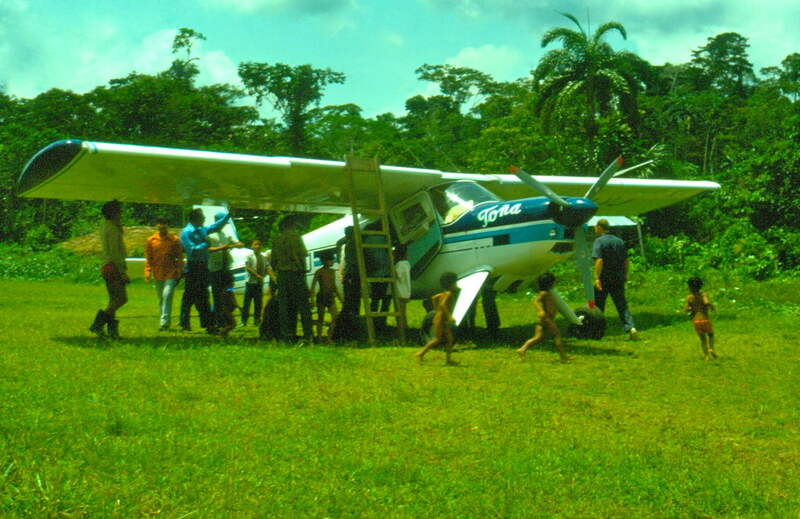 They visited isolated Indian tribes landing on their airstrips, often no longer than a football field and as level as a "freshly ploughed corn field". Their villages would later serve as base camps for exploring the jungle on foot, while the people of the tribe, would show their territories and teach us about their ways of life. 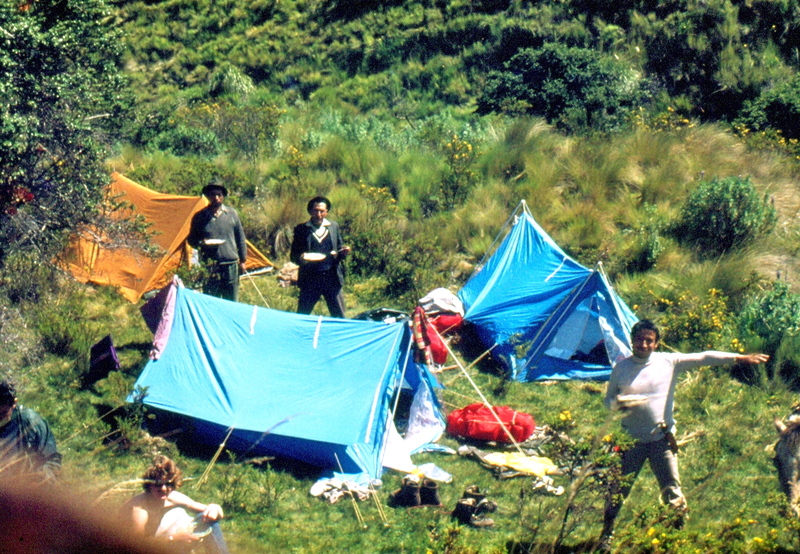 Historical pictures of the 1975 FAO exploration of outstanding natural areas in Ecuador from the slide archive of the the head team-member who later founded the lodge. 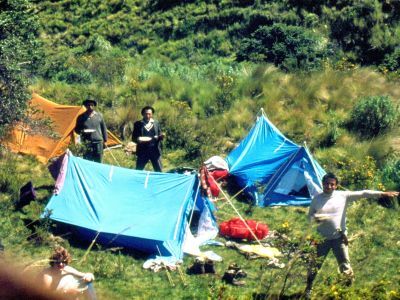 They would first explore by car as far as the road went, like this road into the Sangay area, and then continue on foot equipped with tents on their backs. In the lowlands of the Amazon, they would continue with canoes, as far up-stream as they would take them, as shown here were the river was no more than 10cm deep. 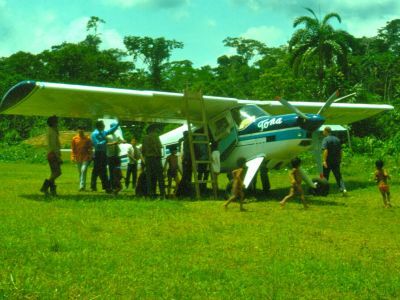 Where they could not get by canoe, they would fly in with Short take-off and landing - stol - Helio airplanes of the missionaries, to airstrips sometimes as short as 90m. End 1976, about 92 areas had been studied and the majority of the areas that now make up the System of National Parks of Ecuador were based on the recommendations of this Study by the FAO (Spanish only). Originally 9% became protected in 13 areas, later to be expanded to currently about 13% in 50 protected areas. 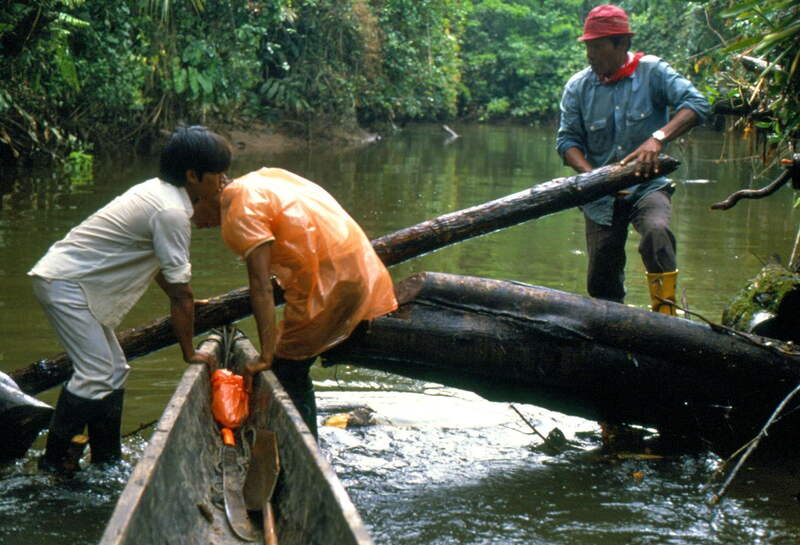 Among those areas was the Cuyabeno watershed, which was to become a "Fauna Production Reserve". Today, very few people know the background of that management category, so, let me explain. In the mid-seventies, the FAO was promoting wildlife farming and game cropping in Africa. So, we thought it a good idea to try something similar in Ecuador, with the idea to finance management costs from revenues generated from wildlife farming and hunting. We thought that it would also create opportunities for the indigenous people of the area, the Cofan and the Sionas, to become a part of fauna production operations taking benefit of their own hunting and fishing culture. 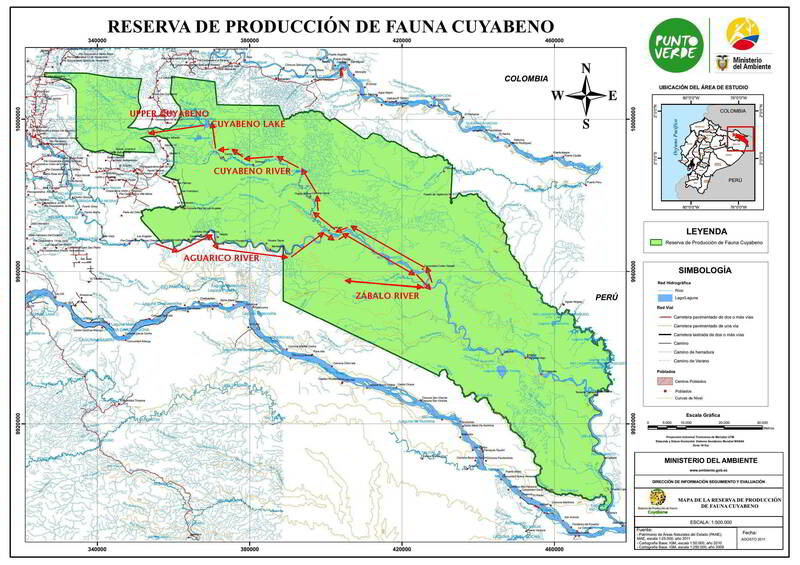 So, Cuyabeno was proposed to become a Fauna Production Reserve. In the course of the years, as the world's attention shifted more towards ecotourism, Ecuador was gathering more and more international fame for its Galapagos Islands as an holiday destination. As a result, legislation was never put in place to allow for commercial fauna production use, and looking back, that was rather fortunate, as humid tropical forests are not suitable for such practices. Now, for all practical purposes, Cuyabeno serves as a national park, and the Cofan and Siona communities are heavily involved in the tourism services, thus providing them with jobs, while much more of their traditional lands have been protected. 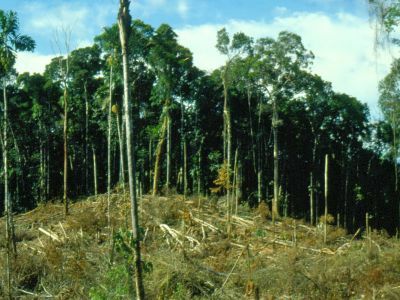 Putting an area under legal protection, however was not enough, and a bit at the time, people started moving into some of the gazetted areas cutting down forest. 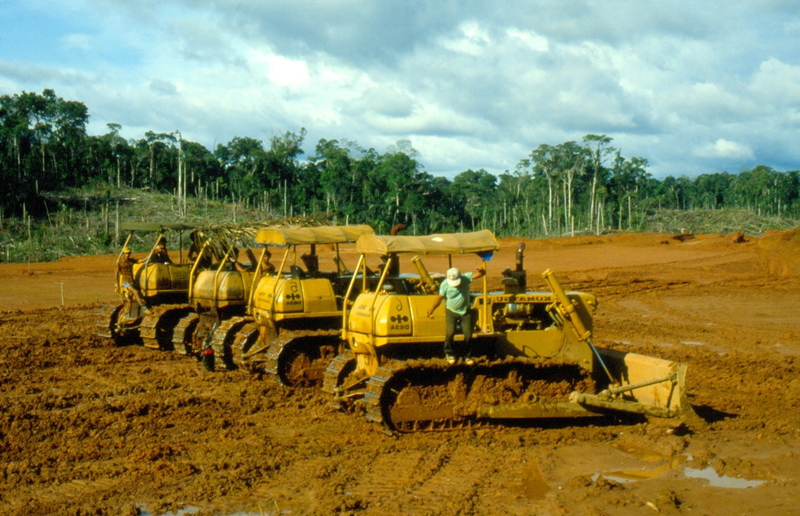 After roads for oil-exploitation had opened the area in 1983, Cuyabeno became very badly affected and lots of forest was being cut down by people who had invaded the Eastern watershed. The, director of the reserve, Dr. Flavio Coello, visited the Dutch former FAO team member, Dr. Daan Vreugdenhil, aka "Parks Man", in his home in Netherlands to ask him to go back to Ecuador and work with him at a solution. After analyzing the situation, the two biologists concluded, that the invaded watershed could best be eliminated from the area as there already were too many people. There was still a lot of uninhabited jungle to "move" the reservation eastward. They advised the Government accordingly and now, the park reaches all the way to the border with Peru, also including the Lagarto Cocha Lakes, thus making Cuyabeno Faunistic Reserve the second largest nature reserve of Ecuador. 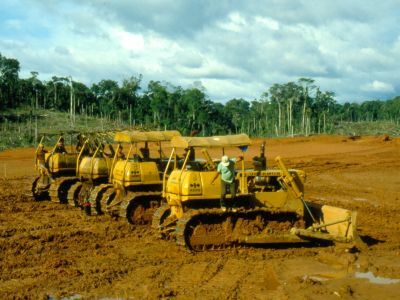 Photos from scans of historical slides of 1983 and 1985 of massive deforestation following the construction of the road to the border with Colombia, traversing the Cuyabeno Nature Reserve. Besides deforestation for oil exploitation purposes (slides 1 and 2) the road had opened up the area for settlers to move in, who started clearing the jungle for raising cattle. 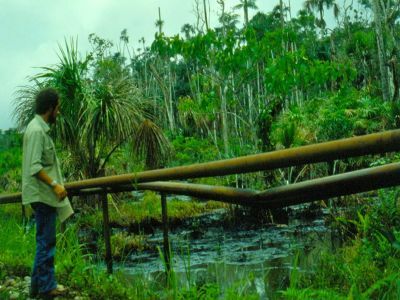 In addition to that, in those years, oil exploitation was extraordinary messy and at each pumping station, the water with remnants of oil were dumped simply drained into the jungle. Please note, these are scans of our historical, partly restored, slides of the 80s. They are not our modern quality pictures. 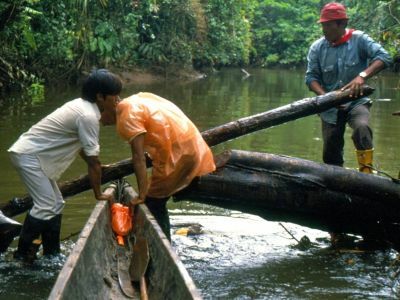 As the reserve was expanded, it created new opportunities to several indigenous communities; particularly for the Cofan, who acquired the right to manage a large proportion of the area, thus - de facto - securing a considerable tract of ancestral lands of more than 100,000 hectares within the reserves boundaries of 590,112 hectares. Cofan park rangers frequently patrol their territories over land and by river. 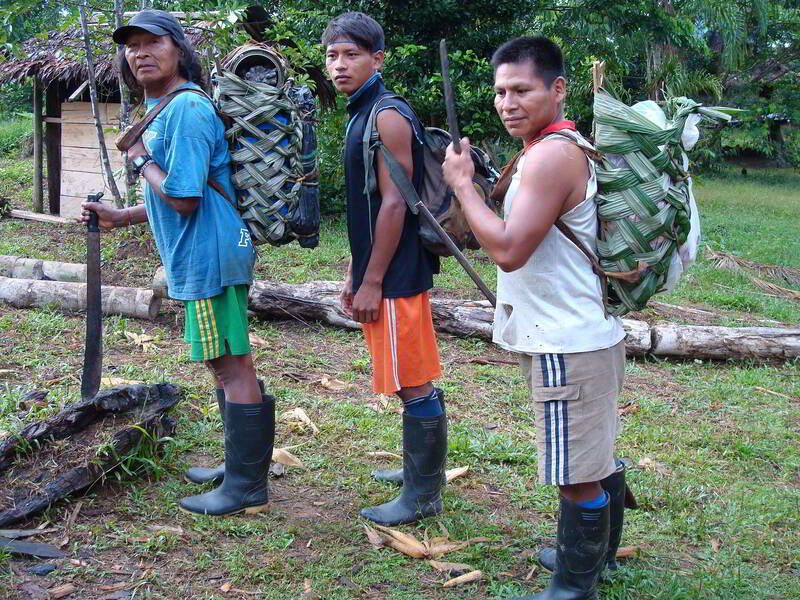 On January 30, 2002 the Cofan were granted legal control over the largest remaining block of unprotected Cofan lands in the form of the new Reserva Ecologica Cofan del Bermejo, the first time a South American government has ever created a protected area that also recognized in its charter its status as ancestral territory of an indigenous group. The reserve also represents the first time ever that the actual administration and management of the area is given directly to the indigenous nationality. This new reserve protects some 57,000 hectares of some of the most biodiverse forests remaining on the globe. At the same time, it guarantees the rights of three Cofan communities to continue their culture, their lifestyle, and their self-determination within this area. Cofans in Zabalo are currently working to bring back some of the traditional animals of their culture to the tributaries of the Amazon River where they live. They are raising turtles and caimans to be released. They are also starting to raise chickens as a source of food. Many animals that live within their domain are endangered in other regions, including several monkeys, tapir and pink dolphin. All have healthy populations in Cofan territories. 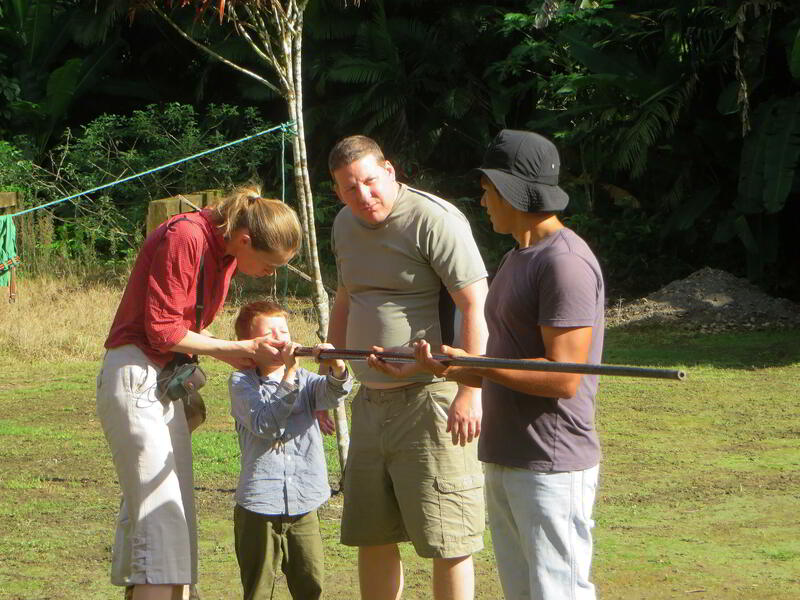 For many years, the Cofan provided ecotourism services to different tour operators, without having our own facilities. 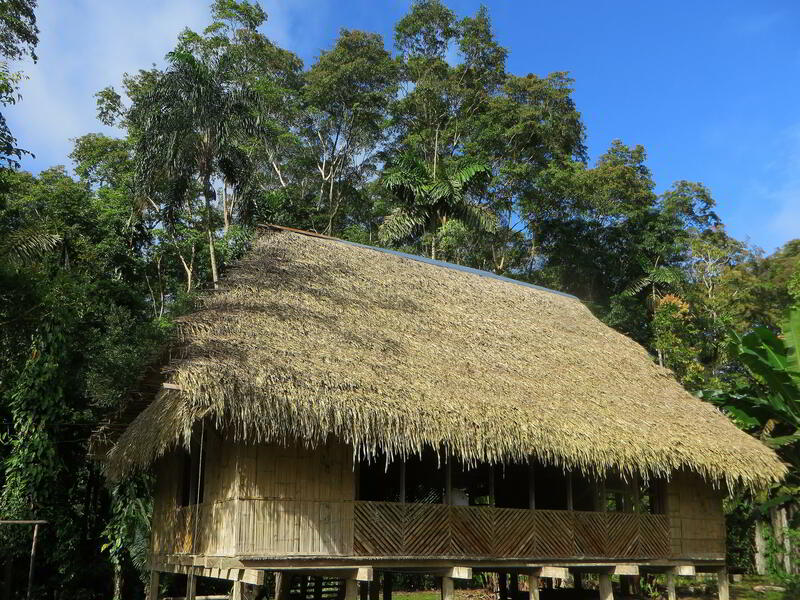 However, recently we decided that we should have our own lodge and our own programs to host you, our visitor, in our beautiful Cuyabeno Wildlife Reserve, so you can enjoy our paradisiacal jungle right from our own village. So we built our own Cofan Lodge. The Cofan Lodge is the only lodge located in a native Indian village from where you can explore the reserve: it has functional amenities, like showers, clean beds with mosquito netting and a restaurant serving both traditional Cofan and international food, and a place where you can hear the Cofan history directly from the Cofan. Located on the shore of the Aguarico River, the Cofan Lodge is ideally located for 2 fantastic rivers: the Cuyabeno River and the Zabalo River. 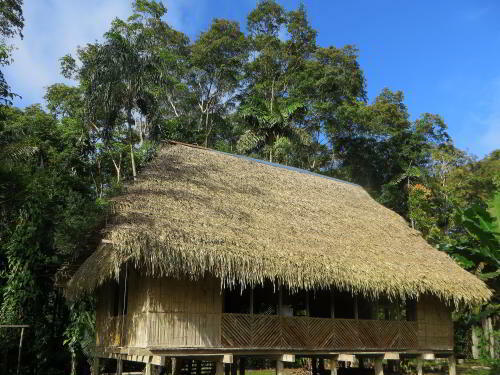 Being a Indian community lodge, our restaurant is totally built after the Cofan traditional housing style. 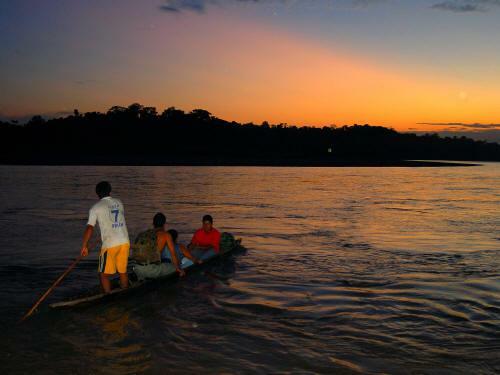 The sun setting over the Aguarico in the Cuyabeno Nature Reserve, Cofans heading home after a day's travel.